PAPUA New Guinea Prime Minister Peter O'Neill has called on the Seven Network to apologise and a journalist to be fired after it aired a story linking Australian aid money to corruption in the Pacific Island nation. The report, which was aired on Seven's Today Tonight program on Monday, drew a link between Australian aid money and the loss of $A1.7 billion to corruption. "These are baseless allegations we can write off as the creation of an attention-seeking reporter's wildest imaginations," Mr O'Neill said in a statement on Wednesday night. "Channel 7 owes PNG and its citizens a big apology and the journalist responsible for concocting such a negative international image of PNG should be dismissed from his employment. "No one has stolen Australian taxpayers' precious 1.7 billion because that amount of Australian money has never featured in any of our national budgets to date." 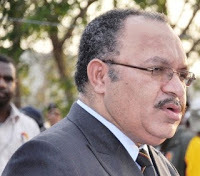 PNG Prime Minister Peter O'neill Getty Iamges. Mr O'Neill urged the Australian government and its AusAID agency to correct the record, calling the story a "misinformation campaign being waged against PNG by uninformed Australian journalists" who did not fully appreciate PNG national affairs. "I can say without fear or favour that the Channel 7 TV report alleging $A1.7 billion of Australian aid money being stolen from PNG's budget annually is the Australian media's most ill-researched, mischievous and misinformed piece of journalism coverage on PNG affairs," Mr O'Neill said. He said the facts are clear and obtainable from the Australian government or Ausaid. "Australian aid to PNG is exclusively administered in Canberra by the Australian government's foreign aid agency AusAID. "Frankly, AusAID runs a parallel education, health and HIV/AIDS, law and justice and transport and infrastructure development program agenda to PNG's own annual budgeted public investment programs." The report contained an interview with PNG corruption watchdog Sam Koim, who said almost half of public monies in PNG are lost to corruption. In an interview with Radio Australia on Tuesday he put that figure at 40 per cent. During a speech in Sydney last year, Mr Koim said about $A1.7 billion had been lost to corruption in PNG between 2009 and 2011. He did not link the money to Australia's $500 million aid program in PNG. At the time Mr Koim tracked $A11.5 million in suspected stolen PNG funds to six properties in Cairns, which he said were owned by politicians and some top level bureaucrats. Mr O'Neill said he has been advised PNG can expect $A500.7 million in aid money over the 2013-2014 financial year. "We are in talks with the Australian government to realign the AusAID programs with our national development priorities," he said. "AusAID has its place in PNG's development but their modus operandi cannot continue to be modelled on a scattergun approach." Comment was sought from Seven.